Following a long-standing Blues Bytes tradition, we use the January Pick Hit section to list each reviewer's Top Ten CDs from the previous year. Discs that show up on multiple lists include ones from The Nighthawks, Sabrina Week & Swing Cat Bounce, The Mannish Boys, Bob Corritore, Buddy Guy, The Holmes Brothers, and more. Noted roots-rock/Americana guitarist and producer Pete Anderson can play the blues, too. 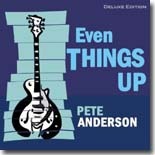 His latest, Even Things Up, is this month's Surprise feature CD. This month's Flashback looks back at a classic George Thorogood album, Bad To The Bone. Our What's New section features new releases from Solomon Burke, Lynwood Slim & Igor Prado, Tas Cru, Mo' Mojo, Mark Robinson, King Bizkit, Marshall Lawrence, and more, plus a review of a blues comic book titled BB Wolf and the Three LPs.